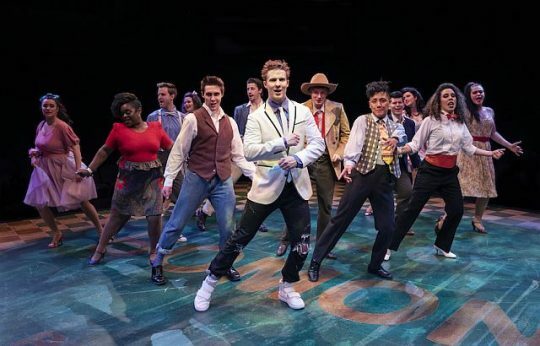 If you bring the family (middle-school age and up) to see “Footloose” at Marriott Theatre, you will likely have interesting talking points after the show. This is a high energy musical that is perfect for adolescent audiences tired of rules, curfews and their town or suburb. Based on the 1984 movie starring Kevin Bacon, the story’s roots are the ideology and actions of a small, rural town in Oklahoma that had banned dancing for almost a century. See the 75 minute “Short Shakespeare! 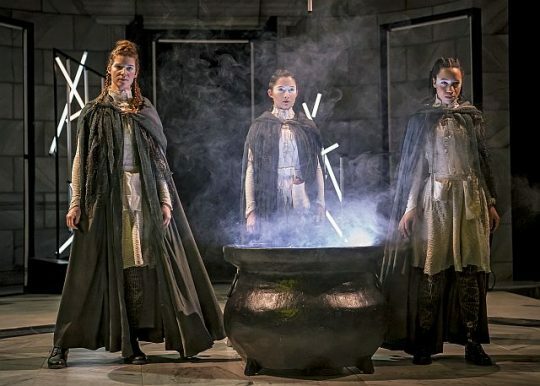 Macbeth” at Chicago Shakespeare Theater on Saturday at 11:00 a.m., Feb. 16. It will continue Saturdays through March 16, 2019. Chicago Shakespeare Theater is on Navy Pier, 800 E. Grand Ave., Chicago. For tickets and more information visit ChicagoShakes/Macbeth. Dr. Seuss’ creative genius is on stage at the Marriott Theatre for Young Audiences Feb. 16 at 10 a.m. 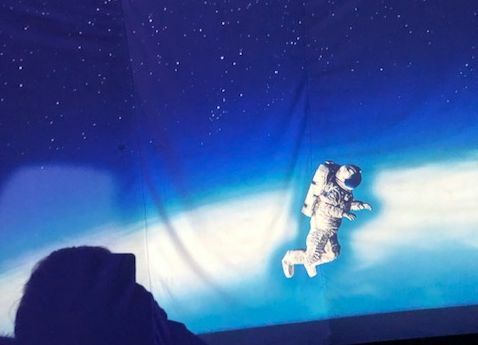 The show continues through March 31, 2019. The theatre is at 10 Marriott Drive, Lincolnshire. 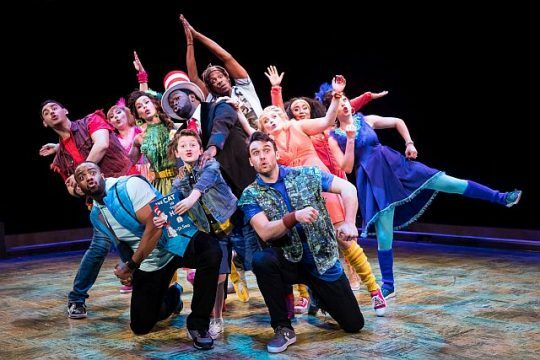 Created by Lynn Ahrens and Stephen Flaherty (the Tony Award-winning team behind the acclaimed musicals Ragtime and Once on this Island), the production combines more than 14 Dr. Seuss stories. For tickets or more information call (847) 634-0200 or visit Marriott Theatre. 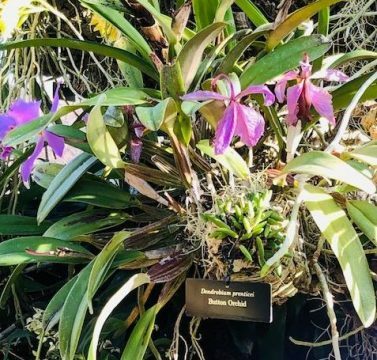 Warm up with the Chicago Botanic Garden’s annual Orchid Show, called “The Tropics” this year. The show is open from 10 a.m. to 4 p.m. For tickets and other information visit Chicago Botanic. Chicago Botanic Garden holds Story Time for ages 2 to 5 on Mondays through March 25, 2019, including Presidents’ Day March18. Story Time goes from 10 to 11 a.m. in Lenhardt Library. Afterwards, get a bingo card to go find objecgts in the garden and greenhouses. No drop offs.A caregiver must be present. The Chicago Botanic Garden is at 1000 Lake Cook Road, Glencoe, just east of the Edens Expressway. For more information visit Chicago Botanic or Story Time. The Adler Planetarium is at the far east end of the Museum Campus at 1300 S. Lake Shore Dr. General admission is free to Illinois residents Feb. 18-21. For more information on what to see and admissions visit Adler Planetarium . At the Field, all of February is free to Illinois residents. There is a lot to see that does not require a special exhibit ticket. The Field is at 1400 S. Lake Shore Dr. at the west end of the campus. For more information visit Field Free. The Shedd is in the middle of the Museum Campus at 1200 S. Lake Shore Dr Free admission for Illinois residents is Feb. 18-22. For more information visit Shedd Free Days. When Charity Hope Valentine is asked why she believes in love, she replies, “You have to have some religion.” In “Sweet Charity,” a show replete with good lines, after all Neil Simon wrote the musical’s book, this expression lies at the heart of the story. However, audiences who have seen the 1969 movie and are seeing the show now at Marriott Theatre, will also catch that the theme that frames the show is Charity’s middle name, Hope. The theatre is in a school building at 300 S. Waukegan Rd. Lake Forest. Citadel is doing “The Little Foxes, Sept. 28-Oct. 28 followed by Joseph and the Amazing Technicolor Dreamcoat” Nov. 16-Dec. 23. An early 2019 show is TBA but then “Sentimental Journey” is Apr. 26-May 26. For tickets and other information call (847) 735-8554 and visit Citadel Theatre. 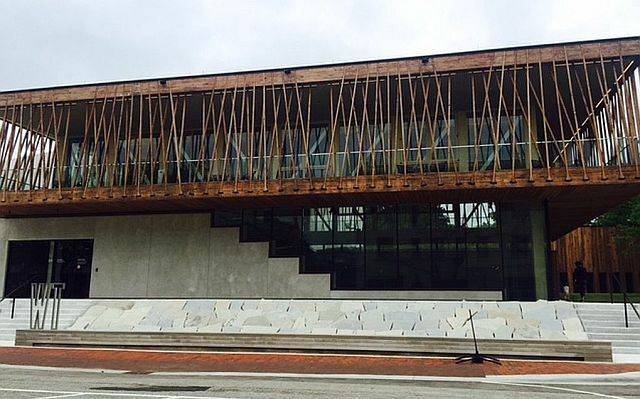 The theatre does professional musical productions in the Marriott Resort at 10 Marriott Dr,. Lincohnshire. The season continues with “Murder for Two” through Aug. 26 followed by Sweet Charity” Sept. 5-Oct. 28, “Shrek the Musical” (children’s show) Oct. 5-Dec 30 and concludes with “Holiday Inn” Nov. 7-Jan. 6. In addition to the shows, the theatre is hosting a fundraising concert in memory of director/choreographer Rachel Rockwell Sept. 17 called “We Three” featuring the stars of Marriott’s “Mama Mia,” Meghan Murphy, Cassie Slater and Danni Smith. For show tickets call (847) 634-0200 and visit Marriott Theatre. To get tickets to “We Three” call the Marriott or order on line tickets at Ticket Master. The Center, at 111 W. Campbell St., Arlington Heights, is currently doing “Beehine” through Aug. 25, then “Chorus Line” Sept. 20-Nov. 3 and “James and the Giant Peach Jr. Nov. 8-10. In 2019, productions continue with “Mouse Trap” Jan. 31-March 16 and “A Funny Thing Happened on the Way to the Forum” May 16-June 29 and “Buddy, The Buddy Holly Story” July 18-Aug. 24. For tickets and other information call (847) 577-2121 and visit Metropolis Performing Arts Center. Productions are usually in Cahn Auditorium on Northwestern University’s campus at 600 Emerson St. at Sheridan Road, Evanston. Currently “Anything Goes” continues through Aug. 25 then it’s “Judy Garland: Come Rain or Come Shine” Oct. 5-14 and “Into the Woods” Dec. 22-31 . For tickets and other information call (847) 920-5360 and visit Music Theater Works. “Murder for Two,” creatively staged and directed by Scott Weinstein at Marriott Theatre, will delight audiences seeking light, hilarious comedy. A fast-paced musical with book and lyrics by Joe Kinosian and Kellen Blair, the show revolves around which guest at a surprise birthday party shot the guest of honor, a successful novelist. The kicker is that it is a two-actor show where one person plays the suspects and the other is a policeman who wants to nail the perpetrator so he can be promoted to detective status. As to motivation, it turns out that most of the suspects used the same psychiatrist and he fed the novelist with patients’ secrets for each best sellers. What makes this show fun is the breathless pace of Jason Grimm as he transforms himself into female and male suspects while alternatively playing the piano with Noel Carey, the investigating cop, Marcus Moscowicz. Then there is Scott Davis’ item-jammed, rotating stage which is almost a character in itself. The first hour is a laugh-a-minute hoot, let the puns and rhymes fall where they may. By the last 15 minutes of this 90-minute farce, audiences may be excused if they don’t care who shot the novelist. Probably it doesn’t matter anyway because this isn’t “Murder She Wrote.” It’s a hilarious theatrical bit that is perfect for summer and that shows off the amazing talents of Carey and Grimm. “Murder for Two,” is at Marriott Theatre, 10 Marriott Drive, Lincolnshire, through Aug. 26, 2018. Running time: 90 minutes, no intermission. For tickets and other information call (847) 634-0200 and visit Marriott Theatre. 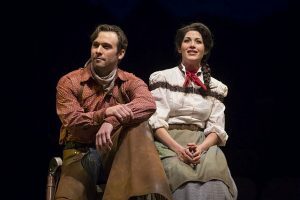 Some folks were singing those popular, ingrained –in-American-culture songs as they left the theatre Wednesday night after the show’s official opening. Audiences can enjoy the musical ‘Ragtime’ with its book by Terrence McNally, lyrics by Lynn Ahrens and music by Stephen Flaherty without knowing where its theme and main rhythm were born. The tales are compelling as are the show’s superb voices. But knowledge of the times portrayed from the early 1900s to 1917, a time rife with prejudice and important movements for women’s rights and better labor conditions, is helpful to appreciating the messages of the musical’s origin, novelist E.L. Doctorow’s famed 1975 novel, Ragtime. It is appropriately named after the syncopated “rags” music popular with African Americans in the 1890s up to the First World War. Doctorow’s novel, and later a film and the musical, follows the fictional fortunes of a wealthy white suburban New York family, an African American couple and a Jewish immigrant and his daughter. They served as a way to zoom in on prejudices against Negros, the term used at the time, and bigotry towards immigrants. The tales are intermingled with actual historical figures such as Harry Houdini, Henry Ford, Booker T. Washington, J.P. Morgan, Emma Goldman, Evelyn Nesbit, Standford White, Harry Kendall Thaw and Admiral Peary. You know the period is the early 1900s by the terrific costumes designed by Sarah Laux and by the story’s historical figures. 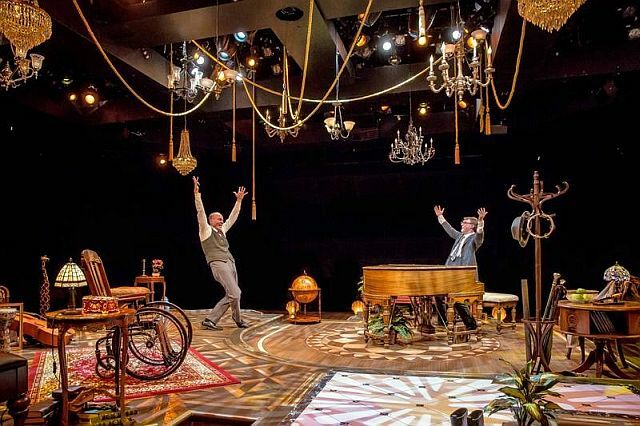 However, similar to the many Shakespearean plays now set in other years, ‘Ragtime’ could be moved to now, more than a century later, and still have a similar impact. The joy of seeing the Marriott show is listening to Kathy Voytko as Mother, the wealthy, caring mom in New Rochelle, and Katherine Thomas as Sarah, Coalhouse Walker, Jr.’s abandoned lover whom he wants to reclaim. It is also the excellent acting of Nathaniel Stampley as Coalhouse and Benjamin Magnuson as Tateh, a Jewish artist immigrant. Indeed, directed by Nick Bowling, the entire cast, a large one at 29 players, is excellent. However special kudos go to Patrick Scott McDermott as Mother’s The Little Boy who has a fairly large role innocently reflecting the thoughts and terms he hear, and Paula Hlava as Tateh’s daughter, The Little Girl who heightens the plight of immigrant’s conditions. The only problem I had with the production was that at 2 hours, 40 minutes, it became too long to appreciate all the fine singing and dancing. DETAILS: ‘Ragtime- the Musical” is at Marriott Theatre , 10 Marriott Drive, Lincolnshire, now through March 18, 2018. Running time 2 hours, 40 minutes with one 15 minute intermission. For tickets and other information call (847) 634-0200 and visit Marriott Theatre. Note: Ragtime contains strong language and content relating to race. It is recommended for ages 13 and older. ‘Sleeping Beauty’ at Marriott Theatre, a charmer for all ages, is Marc Robin’s non-traditional adaptation of the Brothers Grimm fairy tale. Princess Amber, beautifully sung and interpreted by Elizabeth Telford, does prick her finger on the deadly spinning wheel but she’s a figure that today’s young girls should love because she‘s adventurous instead of prim and proper. As to the three good fairies who bestow good personality traits, they are the very colorful Ruby (Danni Smith), Periwinkle (Cassie Slater) and Marigold (Sharrissee Hamilton). The supposedly wicked Magenta (Meghan Murphy) casts the death spell as revenge for being snubbed by the father of current King Lapis, played as a nice but foolish man by Steven Strafford. The characters’ helper is the elf, Topaz, interpreted with a few Spanish phrases thrown in by William Angulo. Names are important to the show because this is the kingdom of Colors which had made the fairy, Magenta, and purple illegal. In the end, King Lapis changes the law so that all colors are welcome. Directed and choreographed by Scott Weinstein, the is a nice, low key message that is a perfect as a conversation starter now at holiday time and throughout the year. 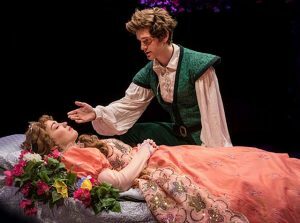 DETAILS: ‘Sleeping Beauty is at Marriott Theatre, 10 Marriott Dr., Lincolnshire through Dec. 30, 2017. Running time: 1 hour plus a Q and A period after the show. For tickets and information call (847) 634-0200 and visit Marriott Theatre. For more shows visit TheatreinChicago. The music and lyrics by Jason Robert Brown will not go down in the American Song Book like Loesser’s “I’ll Know” or If I Were a Bell” but the lyrics are so outrageous that they bear careful listening to or descriptions will be missed because the music sounds so romantic and sentimental. Set “Guys and Dolls” down in Vegas but minus the “Save-A Soul Mission”. Then fly the gal that the gambler pursues to Hawaii with him for the weekend instead of Cuba. Have him ply her with rum drinks and then have them fly back to Vegas. However, the twist in the hilarious ‘Honeynmoon in Vegas,’ is that the guy who has trouble making a commitment is not the professional gambler or a friend like Nathan Detroit, but an ordinary Brooklyn “Joe,” Jack Singer. The problem is that Jack has trouble proposing and sealing the deal at the altar because he says his dead mother put a curse on him so he would never marry. But Jack agrees to fly to Vegas where gambler Tommy Korman sees Jack’s girlfriend, Betsy Nolan, at the hotel where he hangs out and cons suckers. Tommy thinks she is a double for his dead wife and plots how to marry her. Betsy is like Nathan’s Adelaid who wants a commitment. But she really wants it from Jack whom she loves so when it comes to succumbing to Tommy wiles, she reverts to a Sarah like character. What Chicago audiences are getting from this regional premiere at Marriott is basically the Broadway show. The musical’s book is by Andrew Bergman who wrote and directed the original film. It is insightfully helmed by Gary Griffin who directed the show on Broadway at the Nederlander Theatre. Marriott’s amazing choreography is by Denis Jones who did the New York show. 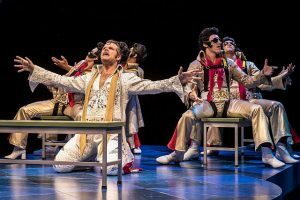 Kudos also to Brian Hemesath, costume designer for the Broadway production, for his terrific Elvis grouping and the Tiki style forms in the Garden of disappointed Mothers. Add to that sterling background, the excellent interpretation of Jack by the multi-talented Chicago veteran actor/composer Michael Mahler, a nicely nuanced portrayal of Betsy by Marriott regular (Eva Peron, et al.) Samantha Pauly, and the perfect depiction of Tommy by Broadway veteran Sean Allan Krill and you have a memorable Marriott production. Other notable cast members are Cole Burden as Buddy Rocky leading the entertainment at the hotel and as Roy Bacon, the Elvis leader, Steven Strafford as Tommy’s sidekick Johnny Sandwich and Christine Bunuan as Mahi whom Tommy had divert Jack from pursuing Betsy. Some of the highlights of the show are whenever Marya Grandy appears as Jack’s funnily scary mom, Bea Singer, who keeps haunting him, and the “Flying Elvises” who help Jack return to Vegas from Hawaii. A quick vignette of Jack flying to Hawaii in a middle seat crowded by clowning passengers is so true to life. The scene where flight desk attendants try to redirect him back to Vegas through Atlanta is a riot but hits on another too-true problem with flying anywhere. 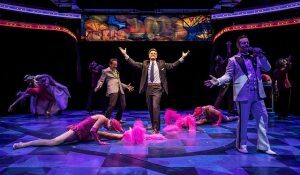 ‘Honeymoon in Vegas’ is at Marriott theatre, 10 Marriott Dr., Lincolnshire, now through Oct. 15, 2017. For tickets and more information call (847) 634-0200 and visit Marriott Theatre.